Lewis Hamilton certainly had us fooled. After qualifying on pole at the Hungarian GP, Hamilton appeared skeptical about his chances at a race win, declaring more than once that it would be a 'miracle' if the Mercedes made it to the top step of the podium. And if we're going to be honest, we may as well admit that we were inclined to agree with him. Given the way things have gone so far in the 2013 season, it seemed like Hamilton didn't really stand much of a chance at the race win. For one, there was the fact that the Mercedes has been notoriously hard on its rear tyres, especially in the hotter climes - and with track temperatures at around 50 deg C, the Hungaroring was sweltering. 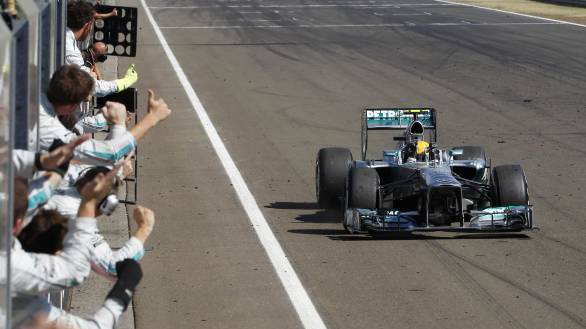 Then, there was also the fact that somehow, the 2013 season hasn't gone Hammy's way, with his team-mate Nico Rosberg taking Mercedes' two wins of the season thus far. But when the five red lights went out at the Hungaroring, Hamilton took off into the distance, and a wind of change blew across the track. Perhaps things would go his way after all. Hamilton's run to the flag, though, wasn't without worry. If there was one man who could rain on his parade, it was Red Bull Racing's Sebastian Vettel. The three-time world champion had started the race second on the grid, and, despite the fact that he wasn't able to catch Hamilton and pass him on track, looked like he might have been able to threaten for race win. But Vettel wasn't able to, especially after losing time behind McLaren driver Jenson Button after his first pitstop. Vettel even damaged his front wing while trying to force his way past the McLaren driver, a move that was ultimately unsuccessful. But, even though the Red Bull was fast, as the race wore on, it became increasingly evident that even a second place finish wasn't looking likely for Seb. Why, you ask? Because of a certain Kimi Raikkonen, who was determined to have his own way at Hungaroring. Let's take a look at the Lotus cars, shall we. Going into the race at Hungary, there were two talking points when it came to the Lotus F1 cars. The first was that they were gentle on their tyres and tended to do well when track temperatures soared, as was in evidence when they finished second and third on the podium last year. The second was that it could well have been Grosjean's day, given that he had qualified third and was starting the race on the cleaner side of the track. When the race started though, Grosjean had a good and bad start all at once. Good, because for someone so accident prone he managed to keep his nose clean and stay out of trouble. Bad, because he didn't manage to keep up with the leaders at the start. His race got even worse when he banged wheels with Jenson Button later on. And Grosjean was unhappier still when an overtaking move around the outside of Ferrari's Felipe Massa landed him with a drive-through penalty, which Grosjean felt was rather unfair. In any case, the damage was done. It would be P6 for the Lotus driver. His team-mate the Iceman would finish second. But at Hungaroring, it was all about the man on the top step of the rostrum. Hamilton took his fourth win at the track, equalling Michael Schumacher's record; became the first British driver to win for Mercedes since Sir Stirling Moss in 1955; took his first win for Mercedes; and moved him closer to Fernando Alonso in the championship standings. So, the next time Hamilton appears skeptical, we'd be very wary indeed.